NEC’s UC Desktop Suite delivers integrated unified communications (UC) that enhance an organization’s productivity and collaboration. It is a scalable, feature-rich solution that simplifies communications management and enables complete mobility. Specifically developed for small to medium size businesses, UC Desktop Suite users become more mobile and efficient. UC Desktop Suite provides an easy, affordable way for businesses to implement UC functionality throughout their organization. 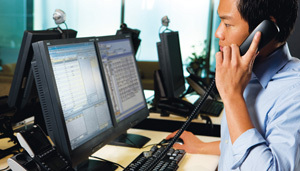 It offers a wide-range of capabilities from managing communications on desktop personal computers (PCs), CRM Integration, Presence, collaboration through a multimedia softphone to placing a complete attendant console right on an operator’s PC. UC Desktop Suite allows you the option of running it on a UNIVERGE SV8100 internal server blade or on an external server – it is fully functional either way. With the UC Desktop Suite and its advanced UC applications, businesses are able to collaborate more easily and provide customers the attention they deserve in today’s increasingly mobile world.